Deb at work in the SILRA collection. This post was written by Deborah Bauder, summer intern in the Smithsonian Libraries Research Annex (SILRA). 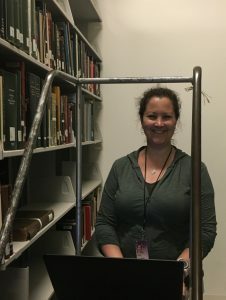 Six weeks at the Smithsonian Libraries goes fast! I arrived here at the beginning of June excited and ready to tackle a project at the Smithsonian Libraries Research Annex (SILRA) under the guidance of Daria Wingreen-Mason. Now in my last week here, I can’t believe how time has flown. I’m a second year graduate student at Syracuse University, nearing completion of my M.S. in Library and Information Science, along with a Certificate of Advanced Study (CAS) in Cultural Heritage Preservation. My goal is to work in a research- or university library setting following graduation. For the last six weeks I have been working on a collections management project at SILRA, which is a legacy collection of over 250,000 items from every library at the Smithsonian. I’ve been performing a collection survey of pre-1923 monographs, determining their suitability for digitization as well as recording information on their provenance. 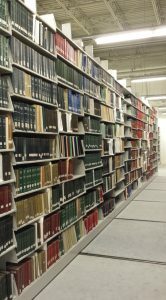 This involves assessing the physical condition of items, classifying them to either Biodiversity Heritage Library or Cultural Heritage Library categories, tracking preservation issues and provenance information in a spreadsheet, and adding information to a shared digitization database (aka “the Picklist”). It takes many experts working together to get objects to a digitized stage. In order to understand the intersection of these relationships, I’ve spent time with the conservators and imaging/digitization experts to understand their processes. This has helped me to make more informed decisions when I go into the stacks for the actual collection survey process. On top of that, I’ve had the opportunity to learn from the expertise of my internship supervisor, Daria, which has been a real privilege. Knowing how to assess a collection, how to categorize and maintain it, is an important aspect of librarianship. So is understanding all of the different types of collaboration that are required in order to manage a collection successfully. This project has allowed me to learn these concepts in a world-class educational environment from people who are experts in their fields. View of the immense SILRA stacks. One of the best parts of this internship for me has definitely been the opportunity to spend time learning from these talented people. Seeing concepts from my graduate coursework in practice has been eye opening, solidifying what I’ve been learning in the classroom. My grasp of the Library of Congress subject headings, for example, is much stronger now that I’ve actually had to use them in a work environment. I have also loved spending time in the stacks, taking in the vastness of the collection and the great diversity of its offerings. Much of the research that has happened at the Smithsonian over the years is represented at SILRA, and the scope is truly impressive. Probably the biggest challenge I encountered was finding myself stopping to look at books rather than actually performing the collection survey. The 19th century travel books were particularly interesting to me. A French Dictionary of the Infernal from 1863 was also a fascinating find. Another challenge was the huge spreadsheet from which I was working; it was hard not to be intimidated by the sheer number of items. In the end, however, as I handled more books my assessment skills improved and I got considerably faster. Now that it’s time for me to leave I feel like I’m a real pro at this! I’ve learned so much from being here, and though the past six weeks have gone quickly there is much that I will be taking with me when I return home to Syracuse. I understand now that it takes the concerted effort of many people to manage a collection. I aspire to one day possess the level of professionalism and expertise that I have seen here at the Smithsonian. Many thanks to everyone, but especially Daria, for being so generous with their time and expertise. This has been an amazing experience! Previous Post Happy 45th Birthday, Warren M. Robbins Library!